The fifth experimentation (this time, organized by the DREAL Bretagne and Strategic Design Scenarios) of the tool box (‘Visioning Toolbox’ for Sustainable Transition of the Territory developed with the Commissariat Général au Développement Durable of the French Ministry of Ecology, Sustainable Development and Energy, together with 4D and ETD) took place on January 17-18th 2014 in the city of Rennes (Bretagne, France) with over 40 stakeholders from various territories. 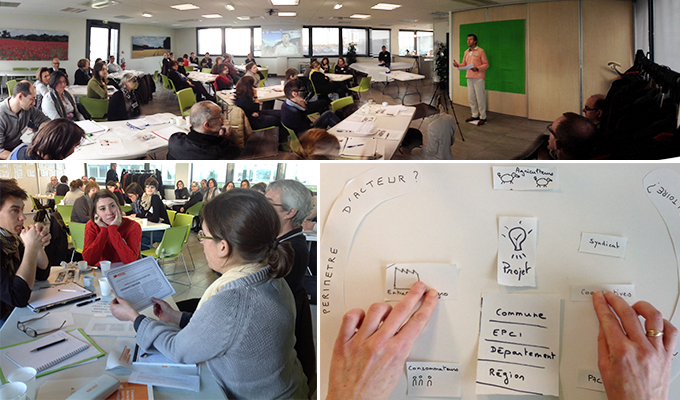 After one day and a half of co-construction of scenarios, the group created three short animated films presenting the 3 scenarios for the Bretagne region in 2030. 1. The group got immersed into the context of 2030 through a serie of fictional headlines from newspapers. Sub-groups chose the most relevant headlines fitting to the regional context and explained why this particular issue was pertinent for the territory. 2. After this immersion in the context of 2030, stakeholders faced a serie of important challenges of 2030. Each group had to explain why and how could the Agenda 21 of Bretagne face positively the challenge through a serie of public policies, actions, projects etc. 3. Then, stakeholders watched the three films made at the national level: Démocité21, Pacte21, Participation21, as an inspiring and stimulation exercise. In 3 subgroups the aim was to build 3 new scenarios based on the national ones but adapted to the local context, challenges and issues. The 3 scenarios were then shared and recorded. 4. Participants watched the 3 movies on the next morning and worked/discussed/revised the articulation between the different parts of their own scenario. The exercice was also to bring more concrete items into the 3 scenarios answering the questions : How do we do it concretely ? How does it work ? What do we invent to make it possible, to reach our goals ? Then as each scenario was re-written, consolidated, participants illustrated the different concepts in order to make 3 short animated movies (below) that were filmed, told and animated by the stakeholders themselves.